Manufactured in the UK by Siemen's after 1919. This bulb is rated 50v 32cp and has a BC base. 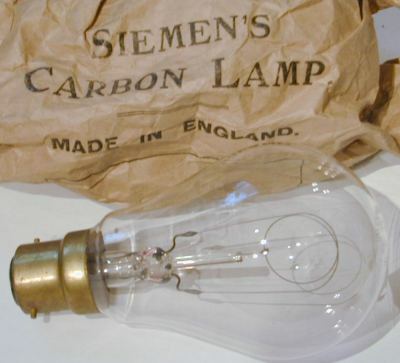 Carbon bulbs still had many uses in specialist applications and are probably still being made. However, this one is certainly made before 1940 and probably before 1930. Siemens & Halske (est 1847) became involved in lighting in 1878 with a self regulating differential arc. Siemens UK operation was running by 1881 when Ferranti went to work there. In 1908 Siemens Brothers and Co Ltd were set up in Dalston, London to manufacture WOTAN tungsten-tantalum bulbs developed in Germany in 1903. Siemens also had a factory in Russia. But Siemens had licensed most of their European rights for Swan & Edison lightbulb manufacture to the Deutsche Edison Gesellschaft (DEG later AEG) in 1883 who by 1918 had grown to be a major competitor. In 1919 Siemens & Halske, AEG and Auer pooled their resources into the Osram company to keep their position in the world market. So who says globalisation is a new idea! 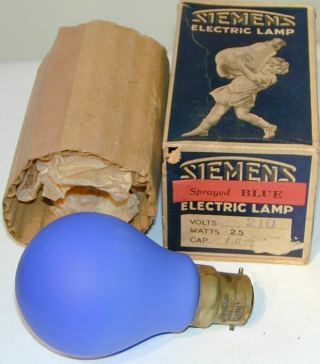 Siemens lightbulb with original box 1920's. Bulb is rated 210v 25w with a BC fitting. This bulb is sprayed with blue paint on the outside of the glass and frosted on the inside. Internal frosting was introduced in 1925. Box has a few minor tears at corners, packing is corrugated card and tissue paper.